​"Having lessons with Katie was amazing. I had a really great time and also, she really helped me improve my technique. I feel like with her I managed to really internalise concepts that until then felt a bit vague to me. I recommend taking lessons with her. She is an inspiring musician, but also a wonderful teacher". ​​"Katie was an absolute gift when I found her! I am a 51 year old woman (girlie at heart) and started playing the drums approximately four years ago. Katie is quite simply brilliant, talented and an excellent teacher. She is extremely encouraging and generous minded with her knowledge and experience. She is also very inclusive (having been invited to and attended several gigs/events she has performed at) all in the interests of learning and having fun. She has been an inspiration to me not only as a drummer and musician, but as a person who is dedicated, motivated and very, very talented. I miss her already"
"Katie was a breath of fresh air for the young drummer in our family. Jacob (aged 13) had got a bit demotivated under his previous teacher, but he soon recovered his enthusiasm for drumming with Katie. Jacob says he liked how Katie lays out her lessons, and the choice between technical drumming and doing songs. We enjoyed watching the results at Rock School UK, which takes place in the school holidays every summer." "I dream about my drum lessons with Katie because it's fun. I like it when Katie plays bass guitar and I play the drums as well!" Discover the joy of playing an instrument. ​Katie is currently taking on new students in South London. She has had a very successful private teaching practice over the past 7 years in Leeds teaching students of all ages and abilities. She was a part time lecturer at Leeds College of Music in 2011 teaching adults from beginner level to advanced. She has been teaching privately since 2005 with a concentration on tailoring each lesson for the individual student in a supportive, encouraging and fun atmosphere. No matter what the age or experience, Katie is passionate about sharing her love for music and the drums. Katie is also fully DBS (formerly CRB) checked. Whether you’ve never played drums before, or you’d just like to brush up on a few things, please contact Katie and book a lesson! Lessons can be as regular or as irregular as the student sees fit. Please note unfortunately Katie doesn't travel to her students. 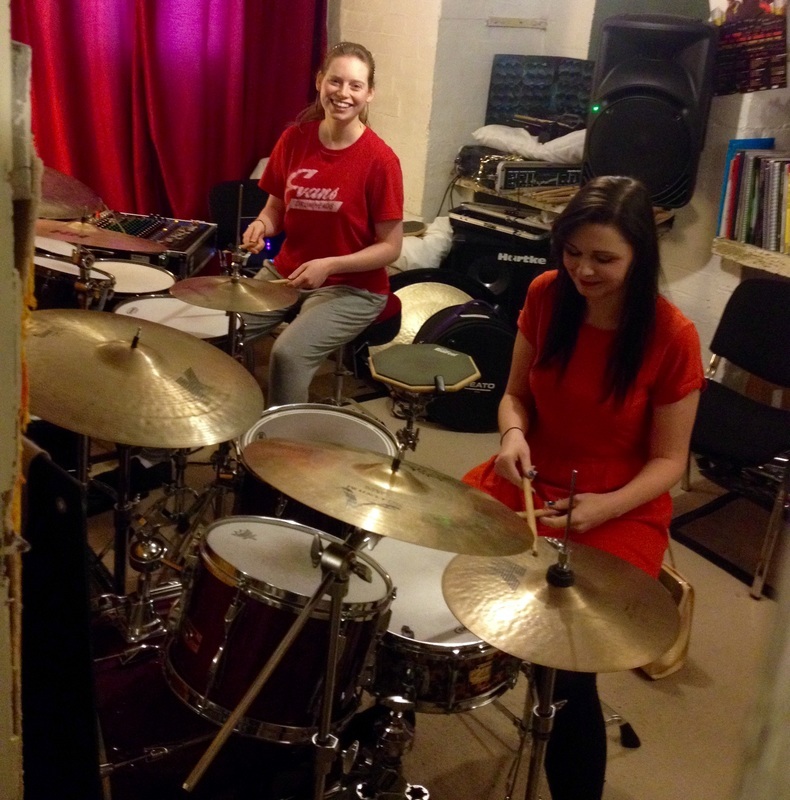 "I had never played drums before starting lessons with Katie. The Monday lessons were the best days of the week! Her classes are fun and you learn lots of techniques, rhythms, and ways to develop your skills. She is an awesome teacher! Highly recommended." "Katie was an absolutely amazing teacher. Her approach to instruction merged the practical with the theoretical which provided a broad understanding of both my instrument and the music. Her lessons, though challenging, never left me feeling overwhelmed, but rather excited to pursue my studies further. In fact, the highest testimonial I can give for Katie is not her incredible talent nor her excellent teaching style, but rather her unmatched, infectious passion for the music. I can say without a doubt that I would never be studying percussion at McGill University (Montreal, Canada) if I had not studied with Katie beforehand, because working with her showed me the drive behind a true artist."